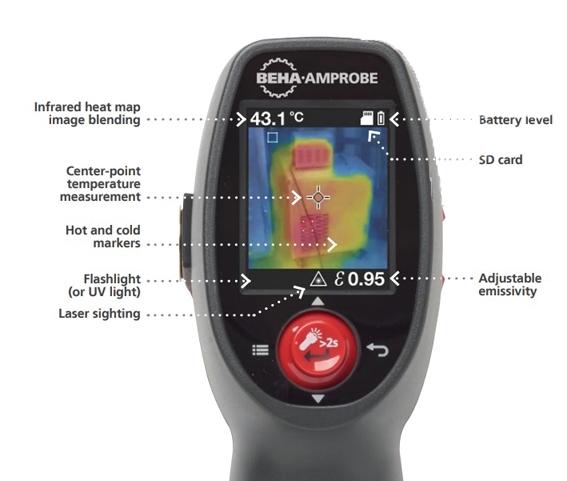 The Beha-Amprobe IRC-120-EUR thermal camera, designed for the professional, is rugged with point-and-shoot functionality to give you a visual heat map image for quick and accurate identification of temperature related issues. Troubleshoot electrical connections, motors, HVAC, mechanical, automotive applications and insulation leaks around buildings to identify potential energy savings. Save and download photos with the included SD card. With a combined experience of over 100 years, well-known German brand Beha and US-based Amprobe have a track record to be proud of. Now we have joined forces, and together we are committed to making your job safer, faster and easier than ever. Our expertise is legendary. Almost 70 years ago in 1948, we invented the very first clamp meter, and we haven’t stopped innovating since. The Amprobe brand has always remained a staple among our stockholding. It's pedigree and price point make the brand a quality offering that rival higher priced brands for comparable technology. You can trust Amprobe, thousands do.From multimeters to voltage detectors, at Beha-Amprobe we constantly improve our designs to provide you with the very best quality tools and support. The FLIR TG167 is a personal handheld thermal imaging camera and IR thermometer in one. This represents a big upgrade over purely numerical indicating thermometers allowing you to also see the heat.